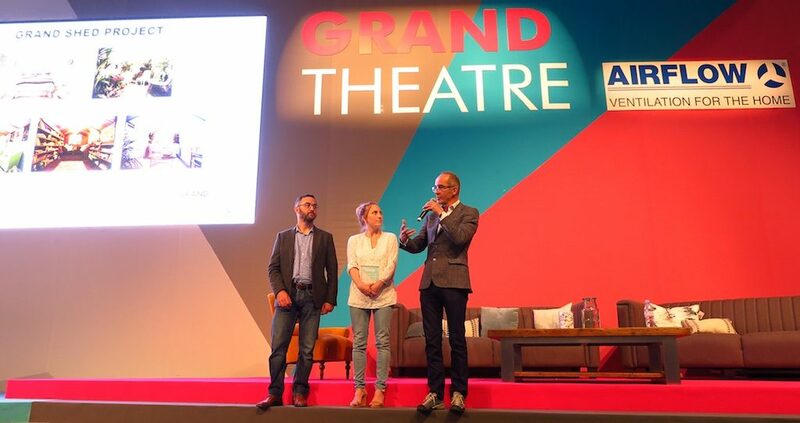 Kevin McCloud (far right) on stage at the Grand Designs Live Grand Theatre. At least one night each week, you’ll find me on my sofa, bowl of popcorn in hand, feet propped on the coffee table, and eyes glued to the TV screen as one of my favourite dramas unfolds. At times, the tension is almost too much to bear. Will a family be torn asunder, a marriage destroyed, dreams shattered like a sheet of two-storey glass installed by a rickety crane while the rain blows sideways over a windy moor? That’s right. This isn’t one of those dark, moody murder mysteries where corpses pile up like cords of wood. It’s Grand Designs, the long-running British home-building series, where cords of wood pile up like corpses. This week at Grand Designs Live, fans of the show have an opportunity to meet Grand Designs’ host, architect Kevin McCloud, and some of the fearless folks who have dared to translate their castles in the air into genuine bricks and mortar (or occasionally, straw and daub). 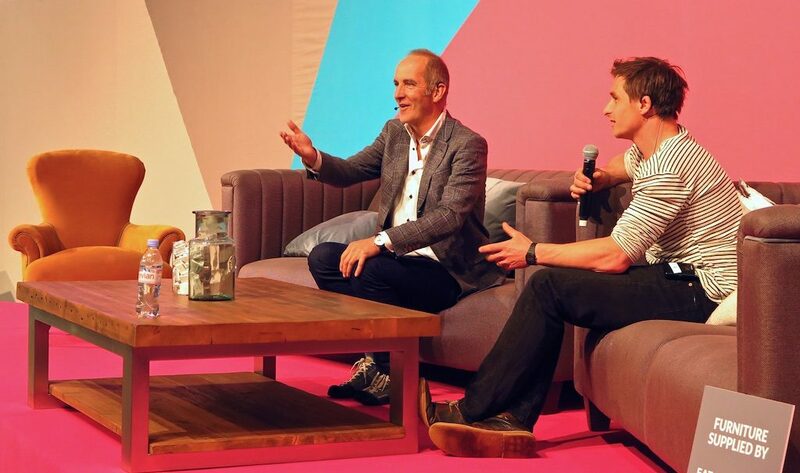 Tom Raffield (right) and Kevin McCloud discuss how Tom and his partner Danielle transformed their cottage with their own bent-wood designs. The event runs through 7th May 2017 at London’s ExCeL Centre, and in October, it heads to the National Exhibition Centre in Birmingham—England, that is. (Sorry, Alabama). Click HERE for a special discount code, offering two tickets to the London show for £22. For aspiring builders and renovators, Grand Designs Live offers a wealth of resources. You can attend design lectures, meet with architects to discuss your own plans, and chat with hundreds of vendors selling everything you ever needed for your abode, alongside loads of stuff you’ll never actually need but can’t live without once you’ve seen it. Amy Laughinghouse, May 2, 2017. No Comments on Grand Designs Live: Great Gadgets & DIY Inspiration. Category: Architecture & Interior Design, England, London, United Kingdom. Tagged: architecture, Grand Designs, Grand Designs Live, interior design, Kevin McCloud.